The objective of the “Impact of 'Green' Technologies on System Reliability” Handbook is to identify the reliability considerations related to key green power generating technologies (solar, wind and geothermal), and to present methodologies and/or models useful in the identification and mitigation of reliability risks. Each topic is prefaced with a brief overview of the current technology and its intended applications, such that consequences of unreliable operation can be better appreciated. Where applicable, each topic includes a preview of key activities in the research and development of 'next generation' versions of the technology. Concerns with the limited supply of non-renewable resources form the impetus for the intense private, national and international efforts currently being applied toward the development of so-called ‘green’ technologies. There is the expectation that these technologies will be utilized in a manner that is compatible with the environment. The term ‘green technology’ has been commonly applied to a wide array of technologies and is often associated with renewable and/or sustainable energy sources, higher efficiency products, and low-toxicity/high re-use materials, where ‘green’ is meant to signify an intended harmony with nature. In the strictest interpretation, the term ‘green technology’ should only be applied to those technologies which present no negative impact on the environment; however few technologies can meet this standard. 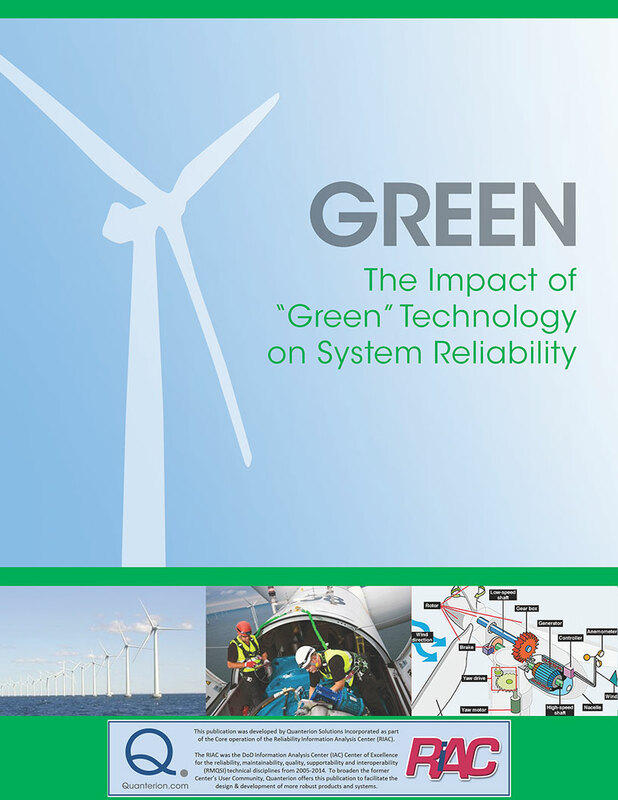 The objective of the “Impact of ‘Green’ Technologies on System Reliability” Handbook is to identify the reliability considerations related to key green power generating technologies (solar, wind and geothermal), and to present methodologies and/or models useful in the identification and mitigation of reliability risks. Each topic is prefaced with a brief overview of the current technology and its intended applications, such that consequences of unreliable operation can be better appreciated. Where applicable, each topic includes a preview of key activities in the research and development of ‘next generation’ versions of the technology. Normally, the reliability risks associated with a technology are evaluated and mitigated during the design cycle. Yet, if the technology or application is relatively new, or if a product is rushed through development in an attempt to garner market share or to steer technology in a certain direction, or simply to meet legislated requirements, there is a possibility that the reliability aspects of the technology may not be fully assessed prior to commercialization. This study is not intended to bias one toward or away from any technology. The selection of a technological solution has many facets other than reliability, including return-on-investment, maturity, geography, physical constraints, and the technology’s true environmental impact, among other considerations. It is hoped that this study will bring about sufficient awareness to persons involved in the selection, procurement, development, integration or servicing of green technologies as to the associated reliability risks, such that technical failures can be minimized, and effective preventive maintenance schemes can be deployed.